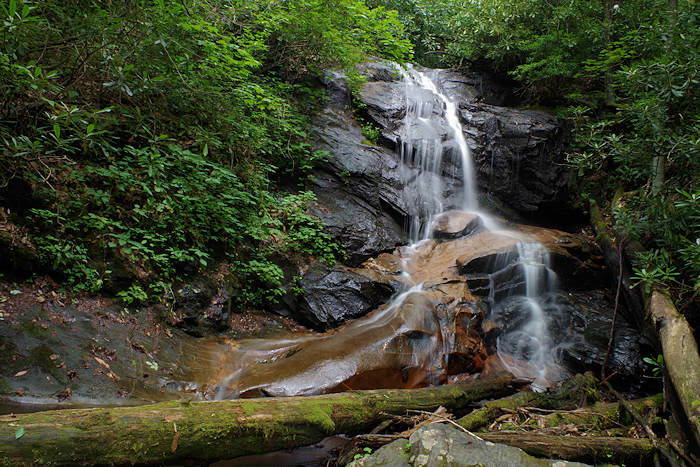 Twin Falls in Pisgah National Forest is a beautiful setting with two nearby 100-foot tall waterfalls that can be viewed at the same time. The quickest way to reach it is a 4.5-mile miles roundtrip, returning by the same route on the Avery Creek (#327) and Buckhorn Gap Trail (#103). Or take a 6.5-mile loop that climbs a ridge after you leave the waterfalls and brings you back via an old road. Both options leave at the same spot, the Avery Creek Trailhead on Forest Service Road 477, about 2.6 miles from US 276 / Forest Heritage Scenic Highway. There's a very small parking area a short drive past the Pisgah Forest Riding Stables. 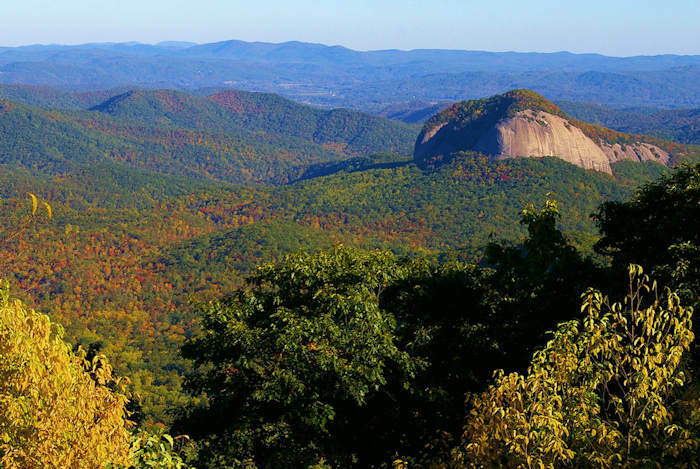 It's just a few miles from the Pisgah Forest Visitor Center. From the small pull-out on the road for a few cars, look for the Avery Creek Trail stake and hike up along the beautiful, cascading creek about 1/2 mile to Buckhorn Gap Trail. Along the way, you will pass a pretty 10-foot cascade. You'll cross the creek several times on sturdy log bridges. The trail is blazed blue and easy to follow. After you intersect with the Buckhorn Gap Trail, the trails run together for a short stretch (with blue and orange blaze). When the trails fork, follow the Buckhorn Gap Trail to the right for about a mile to the side trail to Twin Falls. Since this trail is used by horseback riders, there is usually both a horse and mountain bike creek crossing (without a bridge) and an option for hikers with a log bridge nearby. After you turn onto the side trail for Twin Falls, it's about 1/3 mile walk. 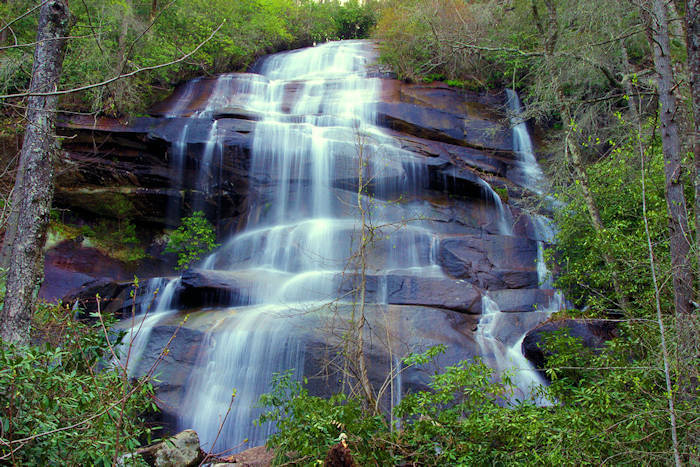 During wetter weather, you'll see a third cliffside waterfall to your left before you reach the set of waterfalls. Views of Twin Falls are best when leaves are off the trees, so this is a great winter hike. However, in the summer when the water is lower, you can get a closer view of the falls. While you cannot get an unobstructed view of both 100-foot waterfalls at the same time, you can see the pair through the trees. At the falls, you'll see a nice camping spot and fire pit. 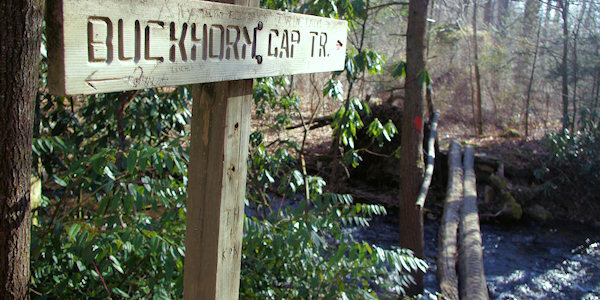 You can return to Buckhorn Gap Trail via a trail that departs downhill from the camping spot. When you get back to the Buckhorn Gap Trial, you'll see hitching posts for horses. From there, return downstream via Buckhorn. It's a moderate hike with a very gradual 500-foot elevation gain. We love loop hikes! 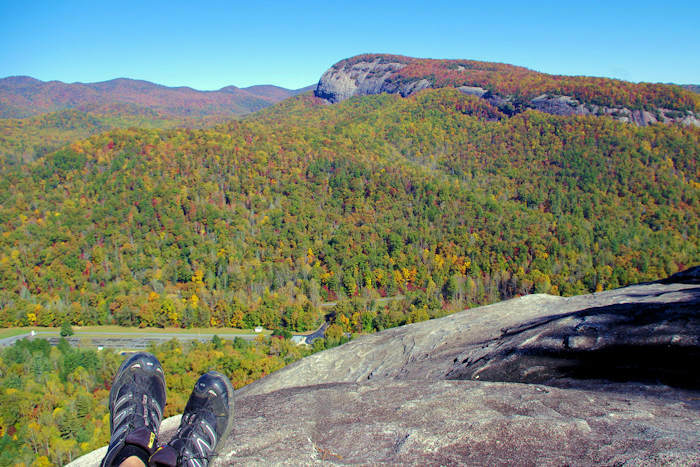 Instead of returning to your car via the same route you hike to Twin Falls, take a left at the hitching posts and head up the mountain on Buckhorn Gap Trail. After climbing the ridge a while, you will reach a trail junction. You can continue straight ahead another quarter mile to Buckhorn Gap to its meeting with Forest Road 5058, or you can take a right turn (east) to pick up 5058 further downhill. Turn right on 5058 and enjoy a easy walk downhill on the grassy forest road. In about a mile, look for Clawhammer Cove Trail on your right. Watch for this closely on your right as the trail marker is about ten feet from the road. It would be easy to walk right on by. This trail will take you back to Avery Creek Trail. Turn left on Avery Creek to return to your car. If you miss the Clawhammer Cove Trail, 5058 comes out at Pisgah Riding Stables. So you can just walk up the road there to your car (and add an extra mile). See map at bottom of page. Pisgah Forest Stables offers guided horseback rides to Twin Falls. The 3.5-hour ride is approximately 9 miles roundtrip. It's for ages 12 and up with some riding experience is preferred. It's about 16 miles from the Blue Ridge Parkway,accessed from the beautiful Forest Heritage Scenic Byway (see directions below), near Pisgah Center for Wildlife Education. (About 40 miles) Take I-240 West / I-26 East. Continue on I-26 East to Exit 40 for Highway 280 (and the Asheville Airport). Take a right onto Highway 280 West and go 16 miles toward Brevard. As you enter the Brevard area, you will see a big shopping center on the right (with Wal-Mart). Just past the center, turn right onto US Highway 276 North (Forest Heritage Scenic Byway) to enter the Pisgah National Forest. After you turn onto US 276 North, drive 2.3 miles and turn right on the gravel road (FR477) that points towards the Pisgah Riding Stables. (1/2 mile past the Pisgah District Ranger Station/Visitor Center.) Drive for 2.3 miles and look for the small parking area for a couple of cars on the right. If this space is not available, proceed 0.3 miles further to the Buckhorn Gap (#103) trailhead, which has parking space on the right for six vehicles. 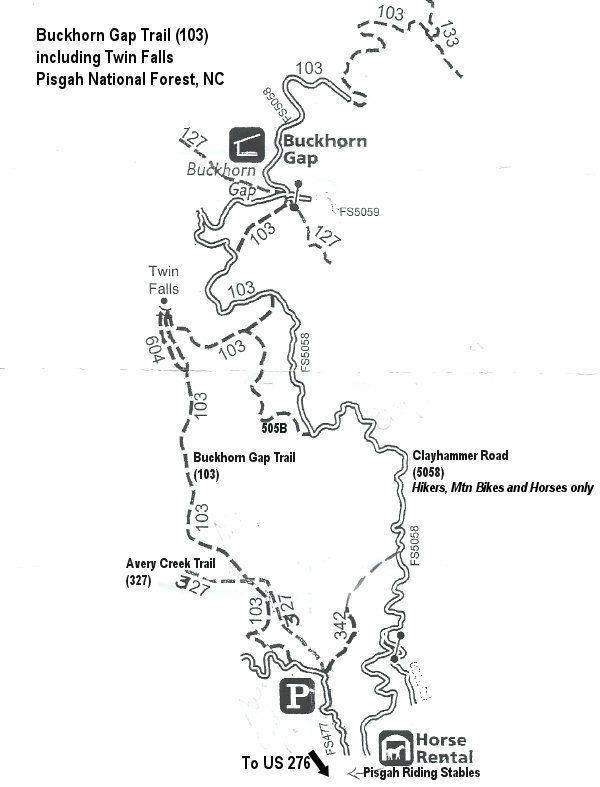 Return to Avery Creek trailhead and proceed as below; or take Buckhorn Gap Trail approximately 0.6 miles to its intersection with Avery Creek Trail (0.5 miles upstream of the Avery Creek trailhead). 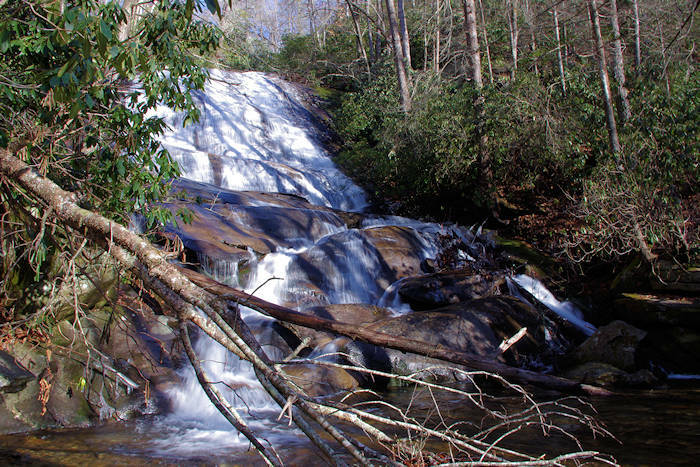 Also see our Pisgah Forest Waterfall & Hiking Map. 5.2 miles - After an easy trip down to Avery Creek, use the double-blazed (orange and blue) portion of Avery Creek trail to proceed approximately 100 yards upstream and cross the creek via the footbridge. The trail then becomes fairly steep as it climbs to Buckhorn Gap. There are several stream crossings with log bridges. A beautiful side trip to Twin Falls is worth the short additional walk: At a small sign marking the beginning of Twin Falls Loop, bear to the left and proceed to the two waterfalls, which are near each other alongside the trail; the loop will return to the main trail a short distance beyond the falls. After crossing Buckhorn Gap and passing the Buckhorn Gap shelter, the trail drops gradually to its end at the South Mills River Trail (#133). 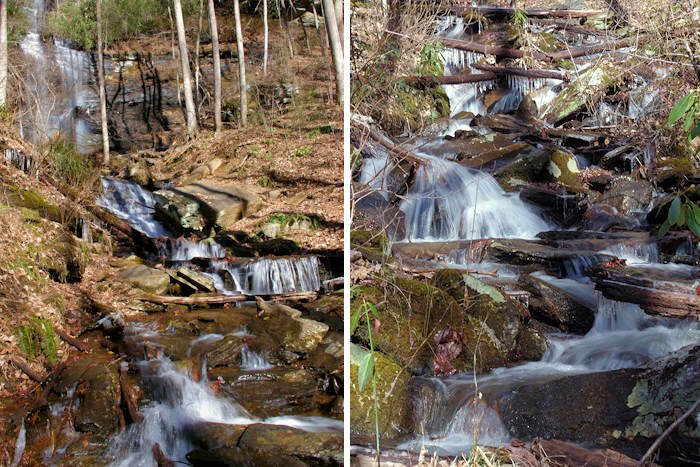 3.2 miles - The first, two-mile section of the trail treats the visitor to pretty cascades and pools along Avery Creek. Approximately 0.5 miles upstream, Buckhorn Gap Trail (#103) enters from the left, overlaps Avery Creek Trail for a short distance, and then departs to the right. Avery Creek Trail continues to follow the creek for approximately another 1½ miles before leaving it and climbing moderately for the rest of its length. You will then find yourself in a mature hardwood forest of yellow poplar, red maple, and hickory trees, and will pass thru a “two-age cut,” one example of a forest management practice. The trail ends at Club Gap, where it intersects with the Buckwheat Knob (#122), Black Mountain (#127), and Club Gap (#343) trails.